How Important Is It To Buy Organic? Snack Girl finally watched "Food, Inc." - and it made her think. She immediately wanted to go out and buy all her food at Whole Foods (where almost all of the produce is organic). Then I woke up to the cold, hard reality of my bank account. So I did what any serious geek would do - I did a study of the price of organic produce where I live. Ouch! It would have cost me twice as much to buy organic for my "once every five days" produce purchase. ARGH! Doing the right thing for the environment and my children is costly, and I have thought a lot about the choices that I make on a daily basis. Yes, I feel GUILT when I purchase the strawberries that are 1 pound for $2 and driven to me from California (I live in Massachusetts) - but they taste SO good. I worry about the amount of pesticide my children are devouring when they greedily eat these yummy berries. Why couldn't I wait until my Massachusetts' farms came up with goods? Isn't local better? What about the environmental impact of my choice? Actually, I can sleep. I made a choice that my children are going to love FRESH food - not processed, packaged crap - FRESH food. Let's use "Gala Apples" as an example of a fruit that I could have purchased for $1.67 more if I had bought the organic version. Apples are #4 on the Environmental Working Groups list of the "Dirty Dozen" of fruits and vegetables that have pesticide residue (see: EWG's Shoppers Guide To Pesticides). "We recommend that people eat healthy by eating more fruits and vegetables, whether conventional or organic,”says Ken Cook, president and founder of Environmental Working Group. “... The health benefits of a diet rich in fruits and vegetables outweigh the risks of pesticide exposure. 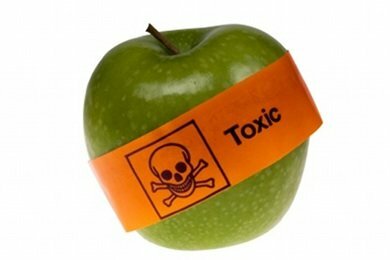 Remember, that it doesn't mean that the apple you are eating was treated with 47 chemicals. It may have been treated with one or two of the ones that were detected. My conventional Gala Apples were from New York State, and were probably from an orchard on the small side. The farmers may have lived in the apple orchard - and, guess what? - they don't like spraying lots of pesticides near their home. The study the EWG is quoting is an average across the nation - your individual produce may not be soaked in chemicals. Of course, unless you bust out your chemistry set in the supermarket - you aren't gonna know what you are consuming. But, fear of pesticides is a really bad reason to avoid fresh produce. My suggestion is to buy organic produce when you can afford it and when you can't - don't worry about it. How do you deal with the high price of organic produce? A New Meaning For The Word "Grass"
Thanks for doing this comparison. You would understand my pure joy when just last week my Stop & Shop FINALLY started carrying organic apples!!! Typically I buy my produce at Whole Foods, but I don't buy 100% organic (pretty close, but not 100%). I find that my particular Stop & Shop produce quality to be really poor. Every now and again I also buy some produce at Trader Joe's. I keep the Dirty Dozen in mind and that often prevents me from buying the standard grapes, because I've heard those are often the worst offender for pesticides. My "stop & shop" also sells organic produce, often at a considerably lower price than the local whole food type store (we don't have a "whole food" here). Yesterday i bought some fresh rosemary from the "whole" store but wasn't thrilled with the quality really so I stopped by the "S&S" where I've gotten gorgeous fresh organic rosemary in the past. They had some, it was beautiful and so fresh and fragrant (the lady ahead of me in the check out line commented on how wonderful it smelled! ), and it was half the price of the "whole" store. We don't have a trader joe's either but I've heard they have organic stuff at a more reasonable price. Same with Costco. We are now 95% organic at our house. We made it a priority, even if we had to cut back elsewhere (not important stuff like paying the mortgage though!) We made rules for ourself and stuck to them: we started out all fruits and vegetables going organic. No exceptions. Then we moved on to 'staples' such as flour, sugar, eggs, etc. And so on. That's how we got to where we are. Another tip I have that helped us, is that weeks where money was tight, I would buy one thing organic that would last. For example, barbeque sauce. A bottle of barbeque sauce will last a couple months (at least in our house). So you feel good building up even if it is a little bit at a time. I almost exclusively shop at Whole Foods and Trader Joe's due to my daughter's severe and extensive food allergies. I've found that I can shop the sales well and save my family a lot of money. For example, in the DC area, Whole Foods usually has some organic apple on sale for 1.99 a pound. I've also found that if I buy in season, the prices are a lot better. For example, organic grapes are $3-4 a pound in the off-season, but they'll drop to $1.99 in season. I feed my family of three a diet that's probably 80-90% organic and spend $600-700 a month. Granted, I do have to make all our foods from scratch so that saves us a lot of money! Have you checked out the top 10 worst pesticide offenders? I try to always follow that for my organic purchasing decision making. 'They say' you don't need to buy organic for bananas and other produce where you don't eat the peel or shell. It's some movie, isn't it? My favorite part is the farmer talking about the pigness of the pig! It's a lot of work, but to switch our diet to a mostly organic or local/pastured/pesticide-free/non-GMO diet, I've cobbled together a range of vendors from joining two food coops, to getting two giant upright freezers for the basement so I can buy meat once or twice a year as whole or half animals from local, grass-fed farmers, hit the farmers markets (and often buy the bruised or "ugly" options to save money), buy produce from a CSA (shop around though, b/c some are more expensive than Whole Paycheck), look for sales at WP (they do exist) and coupons, buy organic stuff in bulk at Costco, buy organic at the regular grocery store with coupons (like those $10 off your order type ones...), and lastly we have a good produce store that sells almost expired produce that has some organic stuff (but you have to use it within a couple days). We do spend somewhat more than we used to, but the savings on meat, in particular, have allowed the organic produce purchases, even when it has to be WP. Sometimes, if I get too wrapped up in these movies or books, I am too harsh on myself. We have limitations with our budget to prevent us from all organic. We try when we can, but more importantly, we're eating fruit and veggies as a first step. I've had quite a bit of luck growing spinach last year, so this year we planted twice as much. It's not USDA organic, but we use organic soil mixture and no pesticides, so it's organic to me. That means I can then not even buy spinach, and use the money we save to splurge on organic strawberries. I have to agree with the post 100%. That is a huge price difference that will really add up over time. If one has the extra money to spend on all organic produce or wants to cut back or deprive themself of other goods, go for it...I'm not one to tell someone how to spend their own money. But, I think the most important thing to take away is to focus more on eating fruits and vegetables and other whole foods and choose whatever fits your budget. I think people often feel overwhelmed when trying to switch to a healther lifestyle. I try my best to make good choices, however, I'm not going to go broke for organics. We buy organic when it's on sale and/or whenever possible at Costco or Trader Joe's. But like you noted, price is a consideration so we still buy a lot of conventional items as well. I do love buying apples in season from the local orchard and going to the farmer's market in the summer. Would love to someday buy mostly organic and local items but we are not there yet. I'm not sure if the produce washes/sprays are really effective but there seems to be a visual reduction in the white powdery substance on grapes and the waxy coating on apples, for instance. Thanks for all the great information you share! I agree with Organic Wife, this has become a real priority for me. We buy organic at every opportunity including steering our restaurant business towards places that offer organic - we have a couple great places in Indy metro. The tissue half-life (how long it stays with you) for some of the pesticides is supposedly years long. Don't really want those chemicals getting stored for the long haul! Thanks for putting this out there! I usually buy organic when possible and try to get most of my produce/animal products organic... I think that the price is worth it because the pesticides 1) drastically reduce the nutrient content of the food, and 2) have been related to all kinds of really dangerous health problems. My health is worth the extra dollar! I work for an organic food distributer (and get a discount) so I try to switch to organic when possible. I have actually focused more on all natural cleaning products more so than food. My overall financial situation does not allow for an all organic lifestyle so this year I decided to grow as many fruits and veggies as I can as "organic" as I can in order to compensate. Going organic is not high on my priority list but I do try when possible. You sure you got your numbers right? I've NEVER seen grapes at WF coast $13.05/lb? Is this what you are saying or am I misunderstanding? In any case, using a price per lb comparison might be more fair than a given quantity, as I don't imagine many people would opt to spend $13.05 on grapes! Just saying. Ditto with sweet potatoes. And, just to let you know, I often find the organic items at WF to be cheaper or same price as conventional, when on sale. We do almost all organic. After reading a couple of Michael Pollan books we realized that in the US our food is dirt cheap compared to other western nations, and so we decided to shift our expectations for what food will cost, in order to get higher quality food. Now I don't even know what conventional produce costs, because our priority is organic, and so we budget accordingly. Of course, we don't shop at Whole Foods because it's just way more expensive in general, but we're lucky living in Seattle because there's tons of really good organic produce, at good prices, at regular grocery stores. If you have farmers markets in your city that can be a really good place to get produce. Even if it's not organic, you at least get a chance to meet the farmer and talk to them about their growing practices. You know that you're getting really fresh, locally grown produce, and the prices are usually quite reasonable. We gave up TV. We were paying $70 a month to sit on our butts after 8 pm. We put that money directly toward our grocery budget. I keep the dirty dozen in mind and won't budge on those but am more lenient on the ones not on the list, especially if they are local. I also try to buy in season, and things like grapes are a novelty for us, not a regular occurrence. Apples, bananas, and melons are more affordable. But buying organic isn't just about the pesticide exposure. It's also about supporting the organic industry and using our dollars to show that people WANT organic food. If enough people switched, I'm sure the prices would be affordable. I agree that it is better to eat ANY produce than none or less because of pesticide fears, but I also think it is a terrible idea to use our kids as guinea pigs for the chemical industry. Nearly all pesticides cause cancer in lab animals - and there is virtually NO research on what happens if we eat them over and over again or eat them in combination - or if we consume them in combination with the use of other chemicals in the thousands of nonfood products we use every day. And worth noting that childhood (and adult) cancers are at an all-time high. You should also know that fruits from Chile can contain dangerous levels of pesticides, and Chilean farms in particular have been cited for not following guidelines for export. A chemist I know calls Chilean grapes "pesticide packets" because they are so high in chemical residues. Further, MANY of the chemicals the USDA claims are "safe" for us to eat have been BANNED in other industrialized countries! A great idea is to NEVER purchase fruits or vegetables with edible skin nonorganic (unless they can be peeled. If you have to buy nonorganic apples, peel the skin. Same for nonorganic cucumbers, zucchini, eggplants, pears, etc. It is ALWAYS worth buying organic leafy greens - the price is not much higher on these, and the nonorganic are heavily sprayed. A while back I heard Michael Pollan make a great point - in no other country do people expect to get food so cheap. Americans feel like they should scrimp on their food and splurge on stuff like electronics and entertainment - but in most western nations, nutrition and food quality comes first. And I really believe we have to move toward thinking that way as well. Like I said at the beginning, sorry for the rant. But I lived on an organic farm for 4 years and was really involved in agriculture, and the mainstream industrial food system is just so so so harmful - ecologically, socially, health-wise, and even for worker rights. Why are organic foods so much more expensive??? I've always wondered what the reason is. I would think the pesticides used on "regular" food would be expensive and removing it, when going organic, would be a savings...so it seems like the price should be closer. Where I live, in upstate NY, our grocery store carries both. So it's really easy to compare. I try to buy organic anything where I actually consume the "skin" like strawberries, grapes etc...not bananas or watermelon.. Thank you for this. I try to buy organic whenever possible, but it can be SO expensive. I bought less than two pounds of delicious bing cherries that cost me over $12 - yummy for the tummy, not so much for the bank account. With the economy in the shape its in, and gas prices as high as they are, sometimes buying organic just isn't an option for our family.